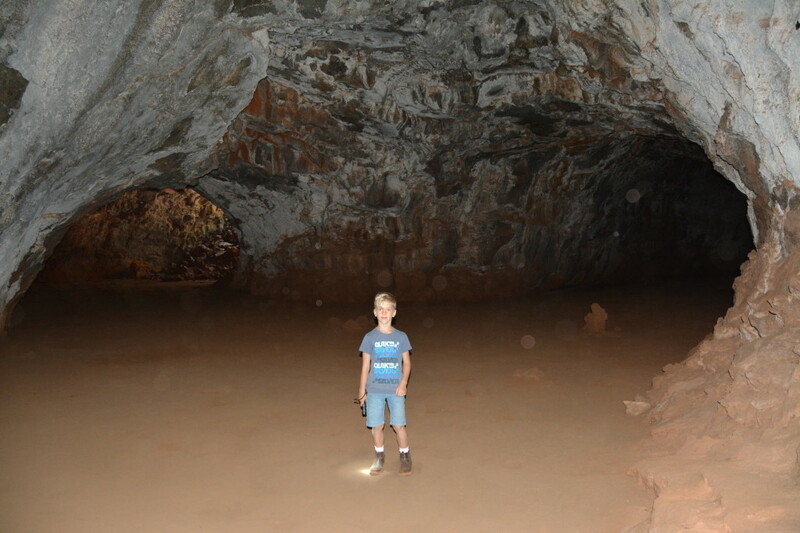 “Best tour ever!”was the boys reaction after visiting the Undara Lava Tubes in Queensland. It’s definitely a must do when travelling around Australia. 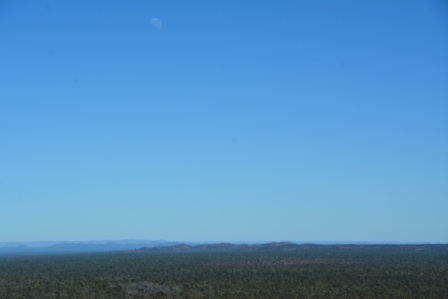 Undara Volcanic National Park is in Far North Queensland, on the landward side of the Atherton Tablelands. The park is evidence of Australia’s volcanic past where huge caves remain in place from of ancient lava flows. 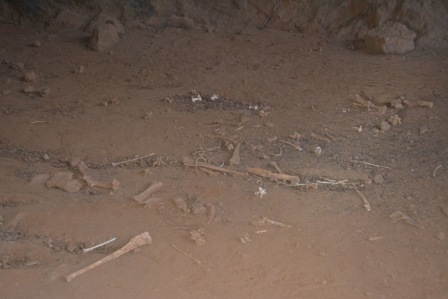 The Undara Lava Tubes were formed when lava flowed into the valleys. The lava at the surface, exposed to the air, solidified faster than the lava below, forming a solid crust. The liquid lava then drained away, leaving the amazing lava tubes. The roof has collapsed in many places, allowing sunlight, plants and animals to visit the ancient wonder. The formation has also recently in the scheme of its age, allowed another visitor, the thousands of tourists who flock there each year. Fossicking is also popular in the area as gems are commonly formed in the pipes of volcanoes. Enormous temperatures and pressures compress and forge stone into gems such as Topaz, aquamarine, gold, garnet and quartz which are all found in this region. There are 190 volcanoes in Undara National Park and the lava tubes here are considered some of the longest and largest on Earth. 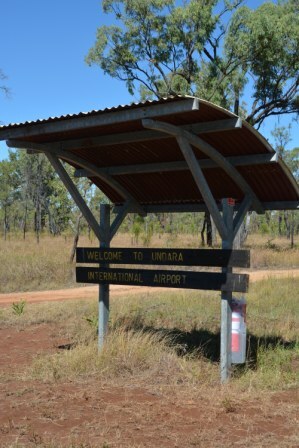 The word Undara in the local indigenous dialect which means “long way.” It’s certainly a long way from the capital cities of Australia. Bayliss Cave is one of the most interesting and important caves on Earth in terms of geology. In its walls can be seen the ripples and contours of ancient lava flows which are absolutely stunning. 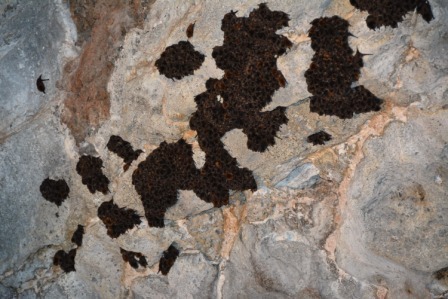 The cave is hundreds of metres long and at times over 10 metres high and is home to colonies of rare ghost bats. 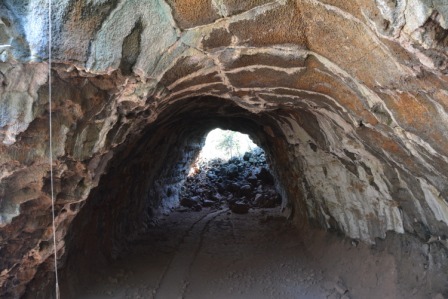 The lava tubes were recognised by Europeans in the late 1800s. Before the creation of the park, the land was part of a property owned by the Collins Family and remnants of the pastoral property include iron and concrete sheds. 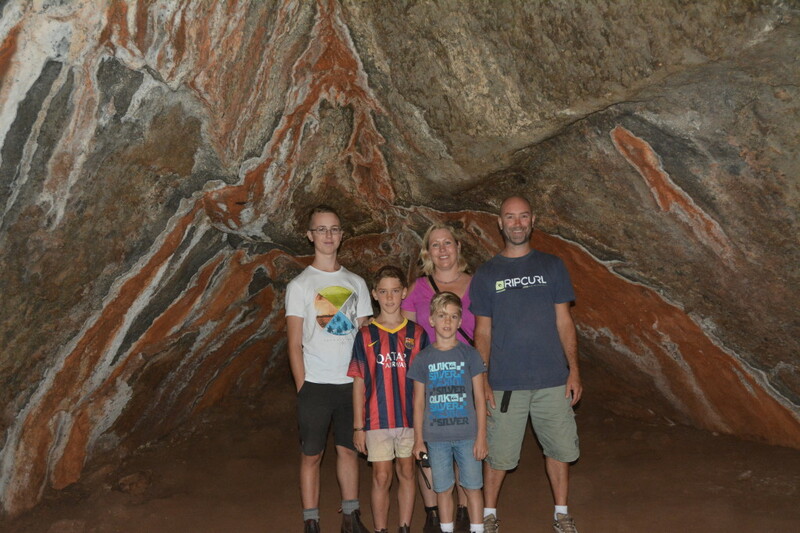 Today, the Collins Family run the Undara Experience, a tour which shows tourists the lava tubes and volcanoes. These tours are operated out of the National Park Campground. An easy trip from Cairns and all down hill once to come down from the Atherton Tablelands. The road is well maintained from Cairns to Mt Surprise. The Gulf Development Road gets pretty narrow further west towards Normanton where you will need to have your wits about you when passing oncoming road trains, especially towing a caravan. 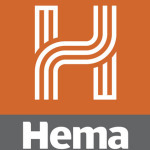 The best time to visit is during the winter months, when the temperature is lower and more comfortable. We visited during the Australian winter when the weather was perfect. It had been raining in the Atherton Tablelands for weeks and the rain stopped as soon as we came off the Great Dividing Range. Little did we know at the time that we wouldn’t see rain for another 6 months until we reached Perth. 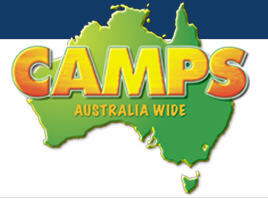 There are a variety of accommodation options near the Undara Lava Tubes. There are campgrounds, a couple of caravan parks and even railway carriages if you feel like sleeping in something different. We stayed at Mt Surprise at the Bedrock Village Caravan Park. They offer fantastic Undara Lava Tube tours that shouldn’t be missed. We were told by fellow travellers that the tour from Bedrock Village were cheaper than the ones offered in the national Park. 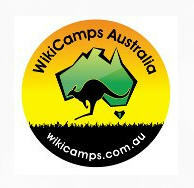 We were not disappointed, in fact Nathan and Lachlan both said that it was the best tour they had ever been on! The caravan park is owned and run by Joe and Jo, easy to remember their names when they say hello! Jo often gets his guitar out in the evening and plays a few tunes around the communal campfire. Not to be missed and even funnier when he lubricates his voice with a few beers. Once you come down from the Atherton Tablelands, the shopping that you are used to on the coast become vastly smaller for choice of food and therefore more expensive. 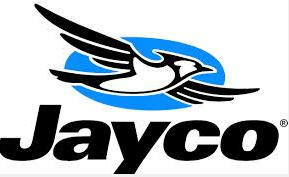 It’s best to stock up in Mareeba or Cairns before travelling through the Gulf and using the smaller towns to top up. We paid $6 for a 2 litre milk in Normanton. 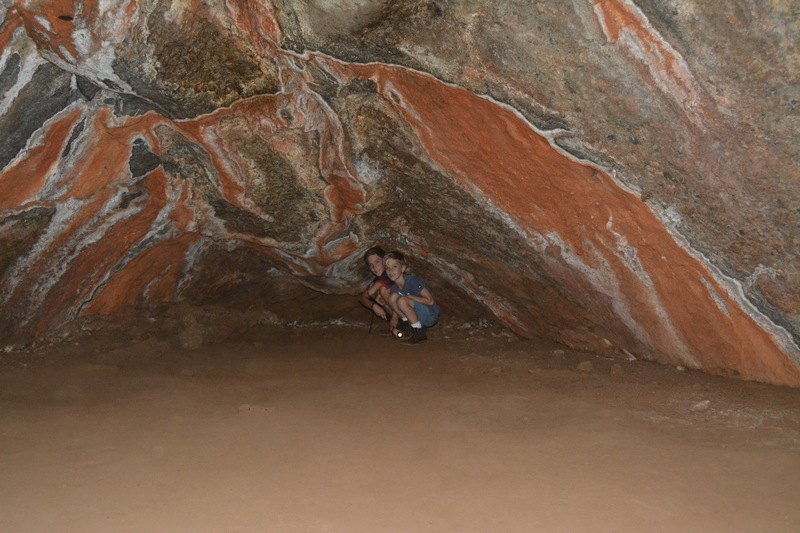 A lot of people in the know stay in Mt Surprise and do the Undara Lava Tubes tour from there. They are the only tour group allowed to run Undara Lava Tubes outside of the National Park. Some of the tour is a little difficult to get through as you will need to climb up and down a few rocks. Take it easy and you will be fine. Be careful walking back along the gravel track from atop of the volcano as the National Park Rangers in their wisdom used a small pebble base that is very slippery. Good shoes a must when doing this tour. Great experience of walking through the lava tubes. There is nothing like it in Australia. The fact that you could walk where lava had flowed millions of years ago. It was like walking through the bowels of an ancient volcano. Anything adventurous that includes some rock climbing, animal bones and cake and the boys are in their element. As parents, we also tricked them into some learning as well! They also discovered the “cold” tree which grow in the area. Put your hands on them and they are considerably colder than any other trees in the region.